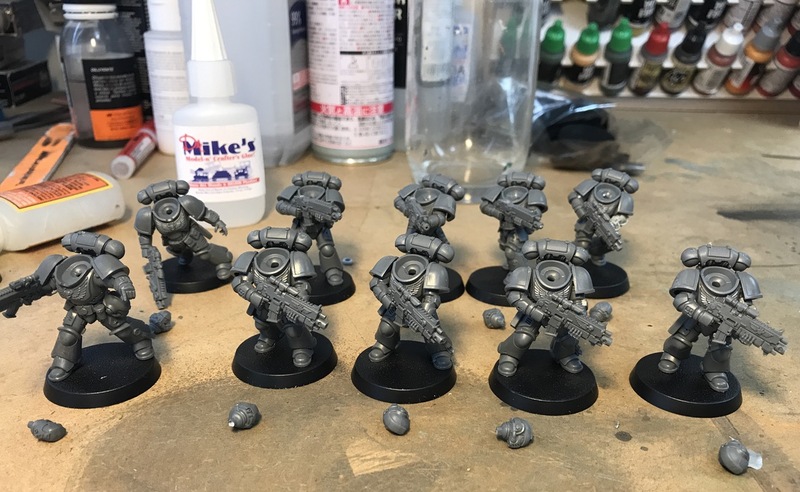 I've finally spent some time putting together the Primaris Space Marines that come in the Dark Imperium boxed set. Initially I was ambivalent towards the new models. As I've hinted at for a while, I've been slowly accumulating a large Dark Angles for to paint. Then these new models dropped. I like them a lot now. All it took was building two squads for my opinion to radically change. I'm not sure I even want to paint old GW plastic marines anymore. I wasn't expecting to experience such a shift. I agree with some of the reviews I've read online that GW must be planning to phase out the old plastics. These new models are so vastly better proportioned than the old kits. Gone are the gorilla pose marines! So what should I paint these up as? Do go Dark Angels as planned, or do I paint these up as ultramarines and add them to the Guilliman model I already painted? Dark Angels, and perhaps you can carry on using any DA you've still got? If starting fresh, then UM or for interest, an UM Sucessor perhaps? Good options there. I love the Praetors of Orpheus. I'm beginning to think that I should paint these guys up like an historic military force in olive drab. I could then weather them like tanks, and cover them in dried and fresh mud. That is a great color scheme! I would go Raptors or either UM or DA. I think they'd look spectacular in your take on the UM livery to match good ol' Rowboat, but to be honest we've had UM Primaris marines aplenty and I don't think I've seen a single Dark Angels version - my vote is for the 1st Legion! 30k and 40k have diverged. I don't think you need to worry about 30k marines. The 40k ones were the uglier older ones. I do think GW will phase out the original marines for 40k. The new models are just vastly better. Photos don't do them justice, but when you put an old model next to one of these it really highlights it. The proportions are just better on the new models. If Guilliman's buffs only work with Ultramarines then I'd go with them. If I'd painted Roboute like you did then I'd want to show him off. I dunno maybe you don't want him to get knocked around in a game. So possibly a successor chapter as mentioned above. Thanks for the nice comment about Guilliman! I'm leaning back towards Ultras at the moment. The decals in the box are just really nice for them.